Home Bea Alonzo Bea Alonzo and Rocky Batara john lloyd cruz Kapamilya stars movie Photos with the Stars Rocky and John Lloyd Cruz Rocky Batara and John Lloyd Cruz Star Cinema The Mistress John Lloyd Cruz and Bea Alonzo's Tandem is a Blockbuster Hit! John Lloyd Cruz and Bea Alonzo's Tandem is a Blockbuster Hit! The tandem of John Lloyd Cruz and Bea Alonzo or better known as "Labers" which is currently celebrating its 10TH year anniversary once more proves its dominance in the blockbuster record. Their recent romance-movie "The Mistress" from Star Cinema now took the second spot of the All-Time Top Grossing Films in the Philippines! I got chance to talk, interview, and mingle (aside from having picture-taking together) with the country's hottest love team during the Blog Con of their movie. We asked interesting questions about them and about their movie. I even got curious how their love team stays stronger for 10 years now. Lloydie revealed that, friendship is the secret! "Hindi kami tatagal ng 10 years kung naging kami in real-life," Lloydie revealed. Actually, this was the second time that I met Lloydie. The first one was during the grand presscon of "Unofficially Yours," his first movie team-up with my female counterpart Ms. Angel Locsin. The said movie which was Star Cinema's 2012 Valentine's movie offering was another top-grosser film! The event also served as my chance to meet the beautiful Ms. Bea Alonzo. Yes, that was my first time to meet Bea in person and to have a "rubbing elbow" with her! She is truly kind in person! Another lady who is beautiful inside and out! In the movie, Bea and Lloydie portrayed a much mature roles far from their previous movie characters. For the first time, Bea plays a mistress! Well, if you didn't yet able to watch the movie, you may check out its full trailer below. In "The Mistress," Lloydie is playing the character of JD, the lover while Bea is Sari, the mistress of the benefactor portrayed by Mr. Ronaldo Valdez. Ms. Hilda Koronel completed the four-sided love affair playing Ronaldo's wife! 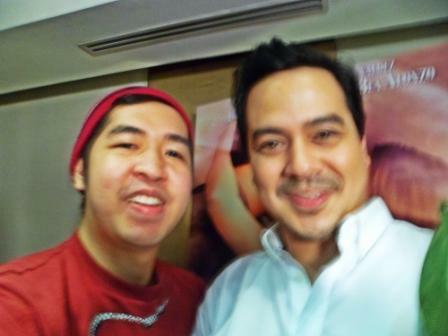 After this blockbuster movie, Bea and John Lloyd return on TV via their newest teleserye "A Beautiful Affair." And I'm also excited to meet them again next week! Exciting!